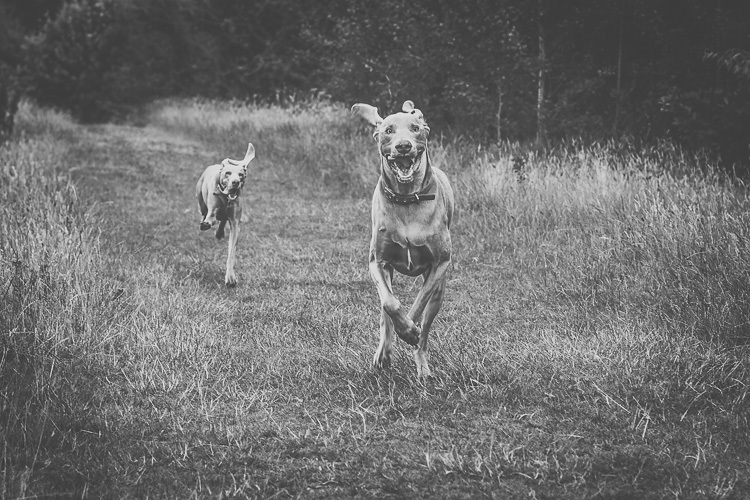 Dogs, by their very nature, are excitable creatures. Of course, they like nothing more than being outside and running around, chasing sticks, balls, and other dogs. All this can’t be conducive to prime lens photography, right? You want a good zoom lens for a job like this, surely? Well, not me. 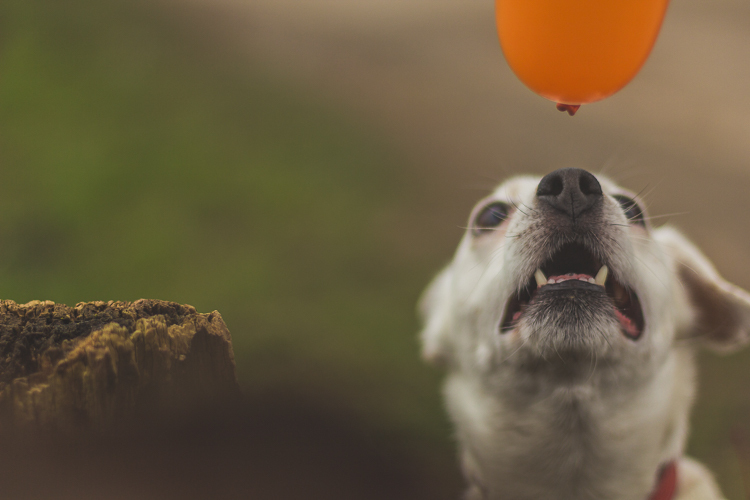 I love shooting my pet portrait sessions with my trusty Canon f/1.4 50mm prime, and I’m going to go through what I consider to be the advantages of doing so, and how best to overcome the disadvantages. 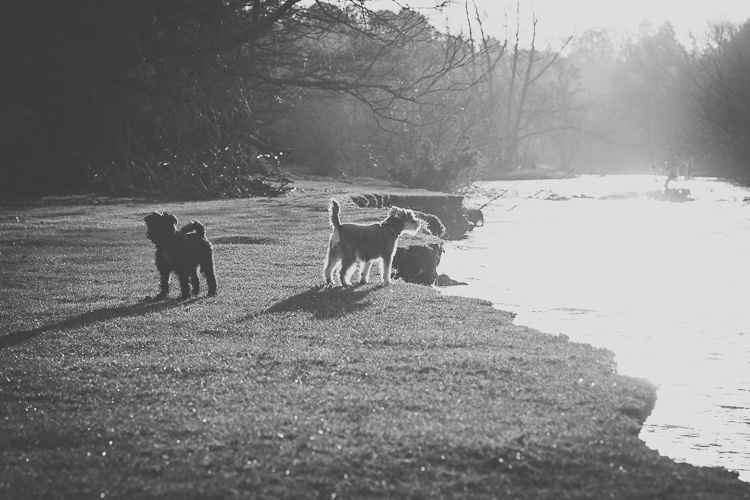 Prime lenses are as quick as the dogs they’re snapping! We’ll start with the obvious benefit of shooting with a prime lens – speed. 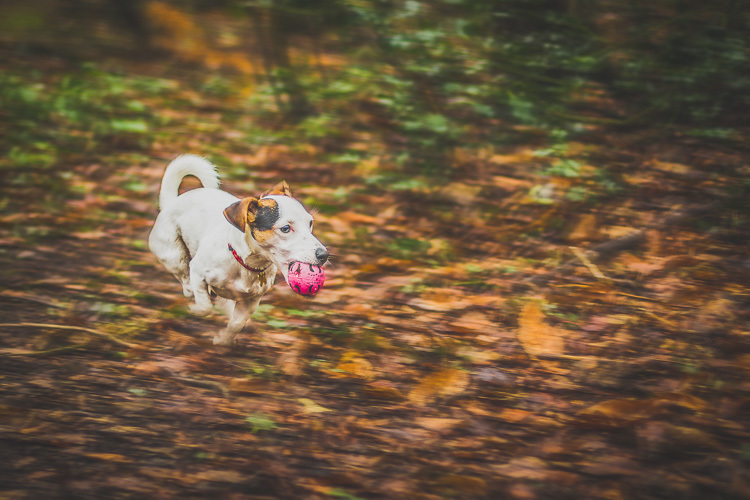 The wider maximum aperture allows for faster shutter speeds, which means that you can freeze your sprinting pooch in action and get pin sharp images as they run (below). 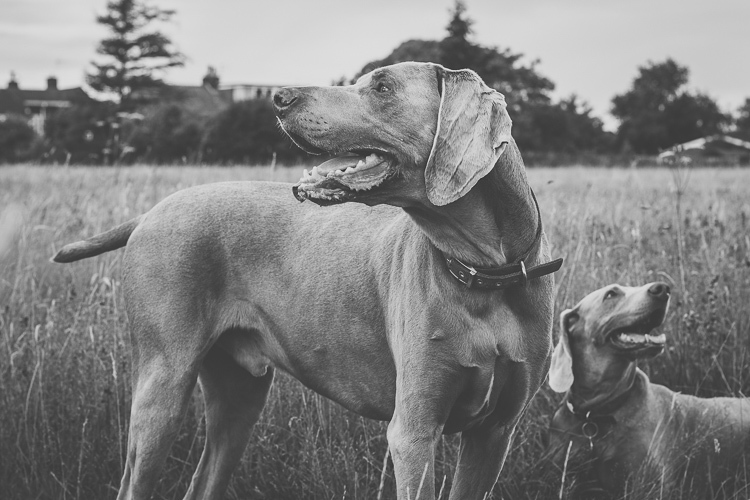 These two Weimaraners were sprinting full pace towards me. Fortunately my shutter speed was fast enough to freeze their movements in full flight. Let’s not forget that the light conditions aren’t always going to be favourable. On dull, overcast, days you’ll be thankful for that extra couple of stops, rather than having to boost the ISO and bring noise into the equation. Bearing this in mind, it’s also important to remember that as you’re widening your aperture to improve your shutter speed, you’re also narrowing your depth of field, so it’s about striking the right balance for the situation. Another well-known advantage of shooting with a prime lens is the image quality. Prime lenses are much more simple than zoom lenses in terms of the components that make them, and the mechanisms that operate them. All in all, it’s widely acknowledged that prime lenses consistently offer an extremely high level of image quality. Sharper images are going to be a positive thing in any situation, but when you’re editing your images and you can zoom in to see all the details in the fur of your subject, and the glint in their eye, then you will really appreciate that image reliability. This is an interesting one, and certainly an argument that crops up time and time again when talking about the benefits of prime lenses. If you only use zoom lenses, there can often be a level of complacency that sets in, especially if you’re relatively new to photography. caption: If I’d been using a zoom lens on this shoot there’s a good chance I would have zoomed in for a tighter composition, with the subject in the middle of the shot. With that option unavailable to me I was able to think about it, and ended up giving the subject plenty of room on the right to run into, improving the overall composition of this image. When you’re using a lens with a fixed focal length, you have no choice other than to move around with your subject. You’ll be constantly looking for different angles and opportunities, and eventually you will find yourself in the perfect position, one that you may never have found yourself in, if you weren’t using a prime lens. If you want to make the pictures of your dogs stand out, then a really tight depth of field is a great way to go about it. A prime lens will allow you to open your aperture to f/1.4 or wider, and really blur out that background, making your subjects pop. The real benefit of this when you’re taking pictures of dogs is that, unlike human subjects, most of the time you’re not going to get the opportunity to place your dog in position with the ideal background. When you’re photographing dogs, more often than not you’re going to have to work with what you’ve got, and having the ability to blur out background distractions is a huge advantage. caption: I was at f/1.4 here, which allowed me to focus on the subjects mouth and nose, while completely throwing everything is the background out of focus. So you’re out with your dog, and he’s running around at full pace for the best part of an hour. Trying to photograph a subject that is constantly moving around can be very tiring, and when you’re looking at your images and seeing a large percentage that will be unusable, it can be a little discouraging. Something you need to be prepared for when taking pictures of dogs, is that you’re going to have a higher amount of rejects than usual. 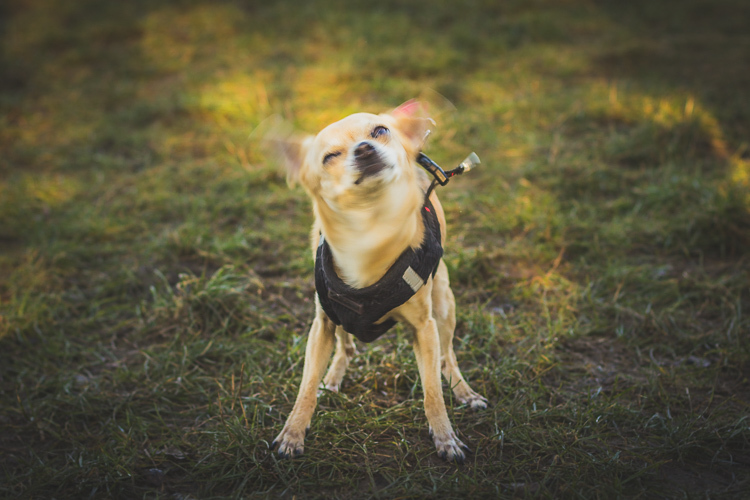 Unfortunately, this is the nature of pet photography. However, if you learn to embrace this, then you can get some really rewarding shots. Make sure you set your camera to high speed continuous burst mode, set your focus point over the necessary area on your subject, and fire away. Yes, you’re probably going to throw away 75-80% of them, but the ones you keep are going to be well worth it. You may find that one of the most daunting aspects of dog photography is knowing where to position yourself. You don’t have the option to zoom in, so where you are physically positioned is vital to getting the shot. In order to limit the amount of opportunities you miss, you need to think a couple of steps ahead at all times. Where are your subjects likely to run next? If they’re going to head over there, then where will you need to be to get the best shot? Should you try to get higher than your subject, or should you prepare to get low in order to get down to their level? These are all questions that you should always ask yourself. 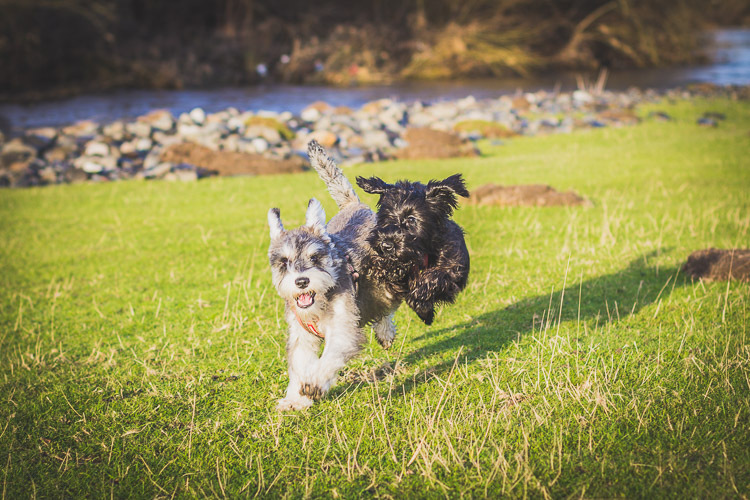 caption: These two Schnauzers were bundles of fun, but they never stopped moving. I constantly had to guess where they would be next. Often you’ll get it wrong, but sometimes you’ll get it right and nail the shot. 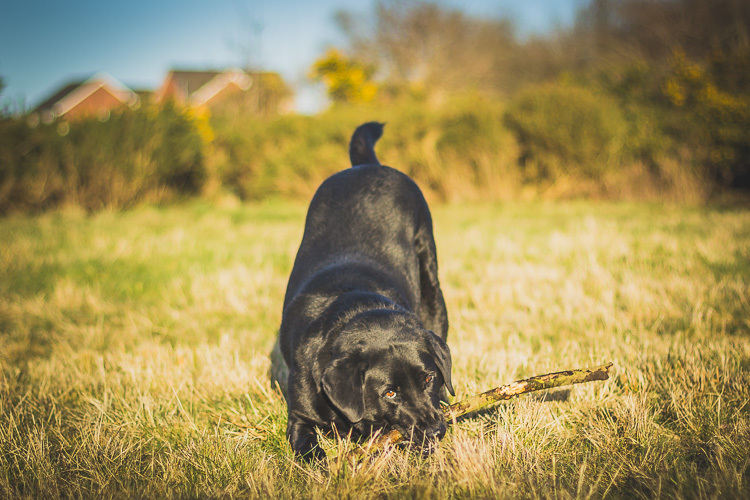 If you’re doing a pet portrait session then you could stand relatively close to the owner, ask them to throw a stick or ball (or pretend to). While the dogs are running away, get into position, and be ready for when they inevitably run back towards you. Remember, your subject is likely to always be moving, so set your focus mode to AI Servo for Canon cameras, or AF-C for Nikon. These focussing modes are designed to continuously adjust focus on moving subjects to ensure that you have the best chance of nailing each shot. You don’t always need to get a close crop of your subject to end up with a great image. 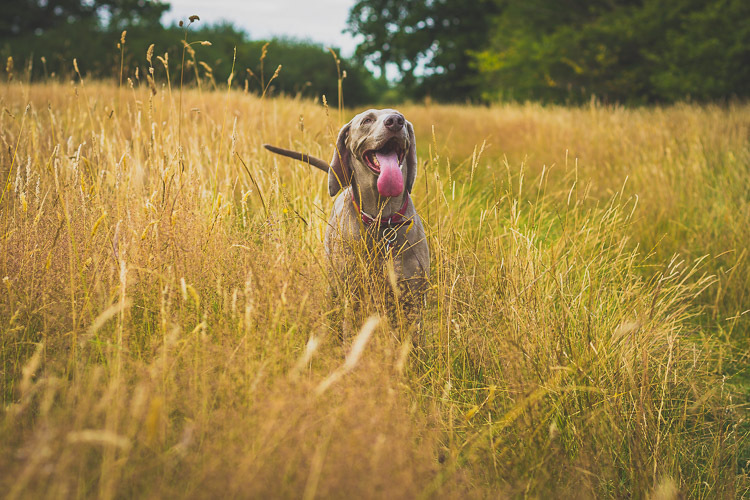 It’s fantastic when you can see their expressions close-up, or the actions of their body and legs as they run, but sometimes a picture of the dog playing in the distance, with a picturesque backdrop of an open field or wooded area, may be the perfect way to portray the scene. caption: Not zooming in on this shot allowed me to capture a greater sense of the atmosphere in this winters morning portrait session. Hopefully this is enough to persuade anyone with an interest in pet photography to give prime lenses a try. You can pick up a nifty fifty prime for the fraction of the price of a decent zoom lens, and you’ll have real fun getting the most out of it. At the very least, you’re guaranteed an excellent workout! 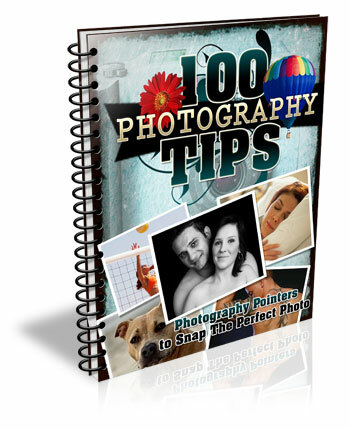 Do you photograph dogs or pets? Have you ever tried using a prime lens? Please share your results, thoughts and comments below. 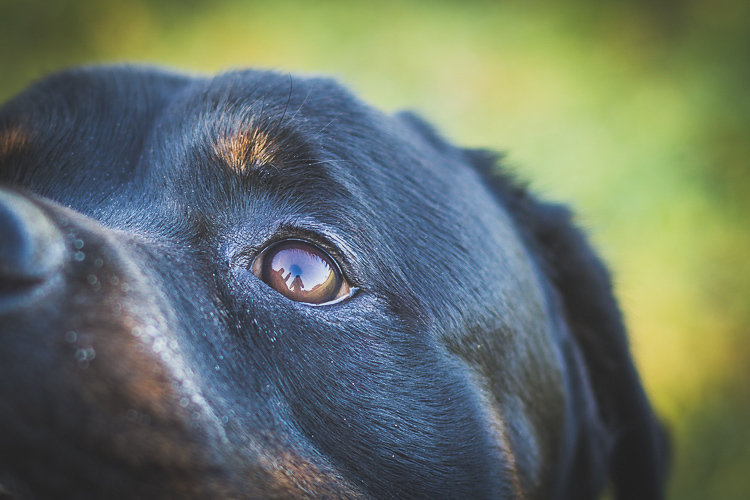 The post Pros and Cons of Photographing Dogs with a Prime Lens by Ben Hughes appeared first on Digital Photography School.